As pregnancy advances, the lion’s share of the work supporting the ever-growing baby bulge falls squarely on the lower back muscles. The further in front the abdomen protrudes, the more work the back muscles must do to stabilize and support the entire area. No wonder lower back pain is a common pregnancy complaint! Muscle relaxers and anti-inflammatory drugs are not recommended during pregnancy, leaving many moms-to-be desperate for a safe, natural remedy for their aching backs. While kinesiology taping is most widely used to treat sports injuries, the mechanisms that help a cyclist’s spasmed back muscles relax and recover are equally applicable to a pregnant woman with lower back pain and spasms. RockTape, the maker of a line of premium kinesiology tape, has been a leader in developing kinesiology taping applications for the aches and pains of pregnancy. 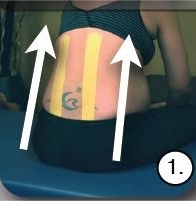 Following is a simple kinesiology taping technique that can bring immense relief to anyone dealing with lower back pain, inflammation or spasms. The tape should be applied with the body curled forward from the waist, to put the back muscles in a position of maximal stretch. 1. Cut 2 strips of RockTape, long enough to stretch from gluteal area to the bra line. 2. 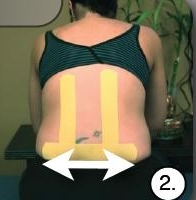 Remove the backing from the first 2-3″ of Rock Tape and apply to the upper gluteal area on one side of the spine. Continue to apply the tape beside the spine, with no additional stretch, removing the backing as the tape is applied. 3. Repeat on the other side of the spine. 4. Apply a horizontal “decompression strip” directly over the most painful area. Take a 6-8″ length of RockTape and tear the backing across the middle. Peel the backing away from the center in both directions, leaving approximately 2′ at each end. Holding both ends of the tape, stretch it to 50% of its maximum stretch and apply, rubbing briskly to activate the adhesive. Then remove the backing from the ends of the tape and apply them with no stretch.